Yes, it's that time of year again. The summer is still in full bloom, but the school season is just around the corner. 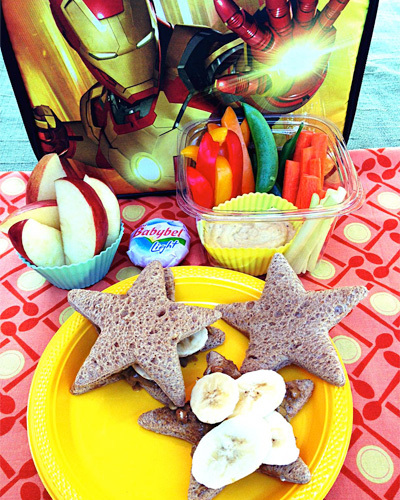 Here, six nutritionist moms reveal what they pack in their kids' lunch boxes. A sandwich (usually turkey and cheese on whole wheat with dab of light mayo and mustard), a high-fiber granola bar, fresh strawberries, individually wrapped cheese, mini raisin box, Pirate's Booty white cheddar puffs, and bottle of water (never juice). Applegate Farms natural roasted turkey breast or chicken breast (three slices or so) on whole wheat bread or tortilla with a slice of American cheese and a little mayo. I also include red or green grapes (or both) -- about a cup's worth or cantaloupe. For beverages I pack a bottle of water and sometimes an apple juice box. As a treat -- for my younger son, Nilla Wafers (maybe 10) or wheat thins (10 or so) or gold fish crackers (a small baggie). For my older son, two Oreos or chocolate chip cookies and/or one 100-calorie bag SkinnyPop popcorn. 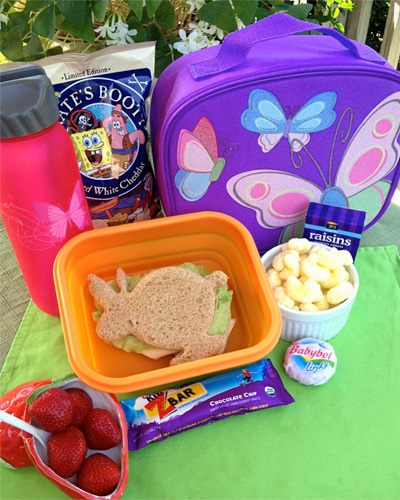 A turkey and cheese sandwich with lettuce and mustard on whole wheat bread, small bag of baby carrots, snack bag of Sun Chips, bunch of grapes, and a Peanut Butter Power Cookie from my book, along with two water bottles. Or, my "A-Plus Pasta Salad" (whole wheat blend pasta with Italian dressing, red bell pepper, chicken, and feta cheese), strawberries, and a homemade granola bar, along with water. I have one picky eater and one semi-picky eater. Packing lunches is always challenging. 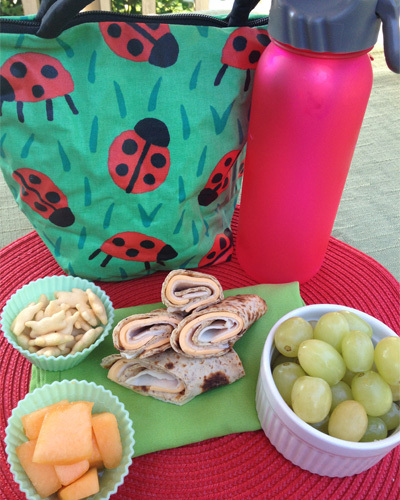 A reusable water bottle filled with ice water (kids don't always stay well hydrated). 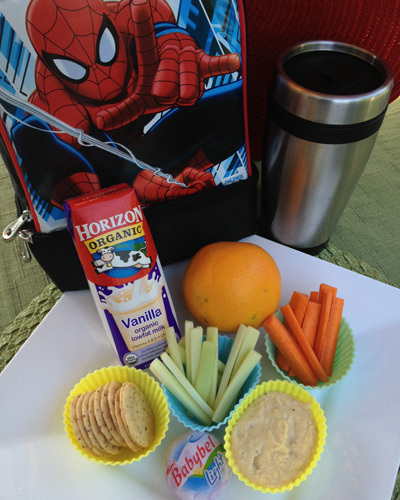 A box of Vanilla Horizon Organic Milk; a cheese round; one medium orange or apple; one serving of whole grain crackers, pretzels or rice cakes; and 1/2 cup of carrot and celery sticks. I try to also include about 2 tbs. of hummus, even if it doesn't get eaten. I feel like if something is packed often enough, 1) it will eventually get eaten, and 2) it sets a good example of something that rounds out a healthful meal. I usually also include two full sheets of graham crackers and an extra milk box, too, if it's a long day they need a snack as well as lunch. My daughter loves wraps, so I tend to provide the ingredients for her to create her own wrap. Usually this means several slices of roasted deli turkey breast, a couple of leaves of romaine lettuce and sliced tomato wrapped in a medium-sized multigrain tortilla. I'll also add frozen grapes (fill a snack-size baggie with washed grapes and freeze overnight) to help keep everything colder -- plus she loves grapes. Extra veggies like sliced cucumbers or baby carrots go in a snack baggie. Then we add a single-serve low-fat pudding cup or a KIND granola bar (pretty much any type -- we like them all at our house) especially if she has field hockey practice after school. And she always buys skim milk at school at lunchtime.